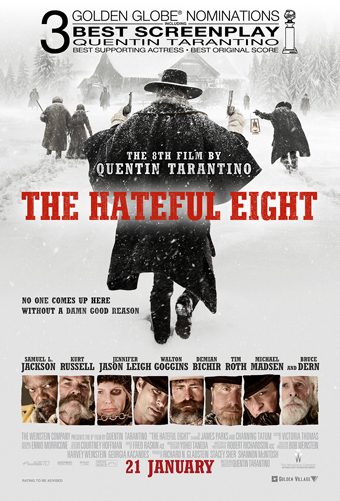 Synopsis: With the town of Rose Creek under the deadly control of industrialist Bartholomew Bogue (Peter Sarsgaard), the desperate townspeople employ protection from seven outlaws, bounty hunters, gamblers and hired guns – Sam Chisolm (Denzel Washington), Josh Farraday (Chris Pratt), Goodnight Robicheaux (Ethan Hawke), Jack Horne (Vincent D’Onofrio), Billy Rocks (Byung-Hun Lee), Vasquez (Manuel Garcia-Rulfo), and Red Harvest (Martin Sensmeier). 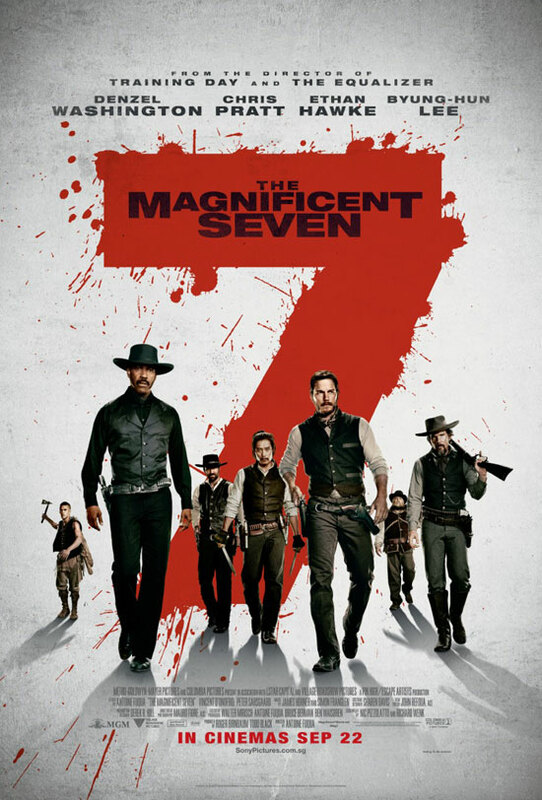 As they prepare the town for the violent showdown that they know is coming, these seven mercenaries find themselves fighting for more than money..
As far as remakes are concerned, Antoine Fuqua’s 2016 update of ‘The Magnificent Seven’ is definitely one of the better ones. 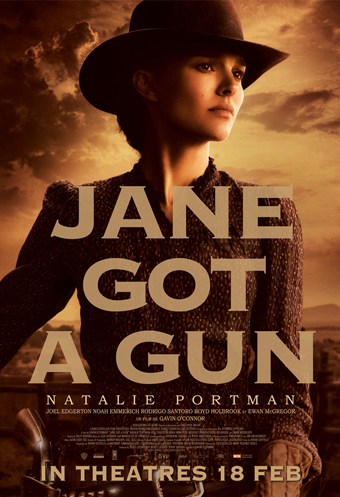 Truth be told, there was really no need for this remake of a remake – that is, a new version of John Sturges’ 1960 western of the same name about a septet of hired American guns protecting a Mexican village, which was based on Akira Kurosawa’s classic ‘Seven Samurai’. The story, as scripted by Nic Pizzolatto (of TV's True Detective fame) and Richard Wenk, remains by and large the same, with the most significant difference between Fuqua’s version and its predecessor being the diversity of the ensemble – instead of being all-white, the titular seven includes an African-American, an Asian, a Mexican and a Comanche. But Fuqua’s sure-handed direction in capturing the spirit of the Old West, as well as the cast he’s assembled to fill the roles – make this an entertaining, engaging and occasionally cheer-worthy old-fashioned shoot-em-up. Oh yes, old-fashioned is the word. 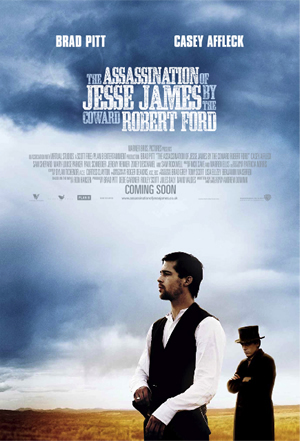 The setting is the year 1879, a time when frontier mining towns like Rose Creek were threatened by robber barons like Bartholomew Bogue (Peter Sarsgaard). Rolling into Rose Creek, the sociopathic Bogue sets the town’s church on fire and guns down the few parishioners who dare stand up to him, giving the rest of the townspeople three weeks to accept his measly offer to buy up their land. 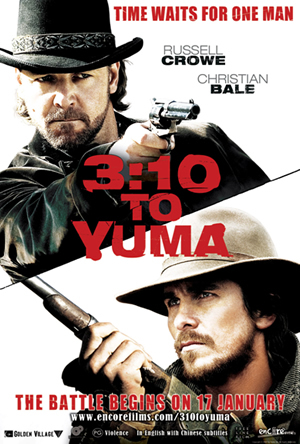 After watching her husband die in front of her, the plucky Emma Cullen (Haley Bennett) decides to organize the town’s efforts to hire a small group of mercenary gunslingers to defend them, beginning with the taciturn bounty hunter Sam Chisolm (Denzel Washington). 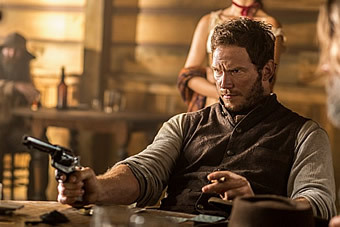 Next up is the wise-cracking rogue-ish gambler Josh Farraday (Chris Pratt) and the ex-Confederate sharp-shooter Goodnight Robicheaux (Ethan Hawke), the latter bringing along his knife-fighting virtuosocompanion Billy Rocks (Lee Byung-hun). The other three rounded up are Mexican outlaw-gunslinger Vasquez (Manuel Garcia-Rulfo), legendary God-fearing tracker Jack Horne (Vincent D’Onofrio) and the native-American archer Red Harvest (newcomer Martin Sensmeier). 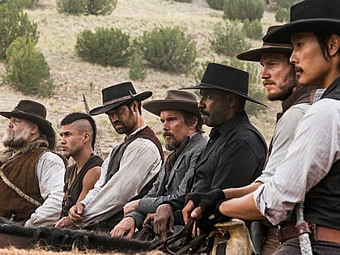 The fact that the ensemble is probably the most multi-racial we’ve seen in any Hollywood Western isn’t made a big deal in and of itself; instead, Fuqua and his writers bring into sharp focus how the so-called ‘magnificent seven’ are really a motley crew united by a common mission, each one of them with their own demons or debt or scores to settle. Vasquez is in because he owes his life to Chisolm. Once a decorated soldier dubbed the ‘Angel of Death’, Robicheaux is now struggling with post-traumatic stress disorder. And Chisolm has his grudge from long ago to settle with Bogue, which calls into question whether he is fighting in the present or for the past. It is inevitable with such an assortment of characters that some will end up falling by the wayside, but for the most part, Fuqua gives each one of the seven his due in the gruff breezy banter that carries the first half of the movie. Saving his firepower for the extended half-hour finale at the end, Fuqua loads up rather on humour and repartee, letting his wild bunch rib on one another as well as on the ill-preparedness of the townsfolk who cannot quite seem to hold a gun or shoot straight to save their own lives. Those looking for wall-to-wall action will no doubt find their patience tested, but it takes gumption for Fuqua to follow in the footsteps of the traditional Western and devote as much attention to detail to the build-up as to the ultra-violent climax. Notwithstanding, the wait is definitely worth it, culminating in a ballistic good-versus-bad battle that is frankly just magnificent to watch. 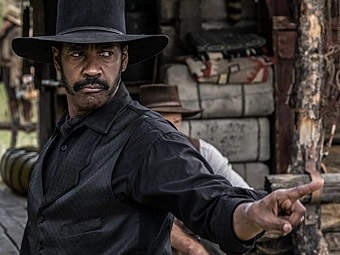 Impressive as they may be in their own right, ‘The Magnificent Seven’ would not quite so live up to its title if not for the charisma of its lead star Denzel Washington. This is Washington’s third collaboration with Fuqua after their Oscar-winning ‘Training Day’ and the more recent ‘The Equalizer’, and there is a certain rapport between star and director which carries the movie. Most importantly, Fuqua has a way of shooting Washington which doesn’t require the actor to say much yet convey much more, such that the latter carries the movie with his own blend of grace and gravitas. Washington also looks oh-so-good riding high in the saddle on a horse, and it is no less than a masterstroke that Fuqua has decided to cast him in his first ever role in a Western, even more significant given how he is essentially a black man playing the lead in a genre historically defined by white men. If anything, it is for this reason alone that this 2016 version proves its mettle against its predecessors. From a storytelling point of view, there probably is little reason to remake Sturges’ iconic oater; and yet, the Western is such an under-served genre in modern Hollywood cinema that an earnest attempt to recapture the glories of old Hollywood should be embraced with warm open arms. Fuqua’s love for Westerns since childhood is well-documented, and he brings that passion to bear in not just the stunningly gorgeous mountain vistas and clear-blue skies but also the down-and-dirty grit of the ordinary heroes that make up the genre. Like we said at the start, this remake is certainly one of the better ones, and if it does fire up love from a new generation of audiences for Westerns, then it definitely is a worthwhile exercise in good-old fashioned heroism.